The Insurance industry continues to undergo significant transformation, with new technologies, business models, and competitors entering the market at an increasing rate. To be successful in attracting and retaining the most valuable customers, insurance companies must innovate and increase the speed at which they respond to customer demands. Traditionally, the insurance software market was dominated by a handful of specialist vendors with products that were initially expensive, difficult to deploy, costly to maintain, and did not provide the speed needed for today's market. 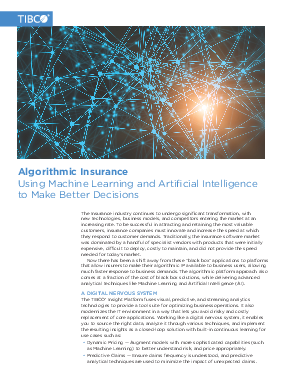 Now there has been a shift away from these "black box" applications to platforms that allow insurers to make their algorithmic IP available to business users, allowing much faster response to business demands. The algorithmic platform approach also comes at a fraction of the cost of black box solutions, while delivering advanced analytical techniques like Machine Learning and Artificial Intelligence (AI).